At the 2011 Budget, LEAP called for "a Windfall Tax on recession profiteers": UK banks, energy companies and supermarkets - to fund job creation and capital expenditure programmes (full report here). John McDonnell MP, said in the 2011 Budget debate, "I think that a windfall tax on energy is appropriate. The current profits of British Gas average 24%, and Ofgem has reported an average profit margin of 38% per customer since last November. That is profiteering during a recession." There are indications the British public agree - and may want to go further. A YouGov opinion poll commissioned by the Class thinktank found that 68% want the energy companies renationalised, while 35% believe the government should have the power to regulate grocery prices (rising to 44% among Labour voters - and 40% of UKIP voters!). The poll coincided with Russell Brand's thought-provoking essay in which he wrote, "Profit is the most profane word we have". Indeed it is. In the last few days Sainsbury's results showed like-for-like sales were up 1.4%, yet their profits were up 9.1% - which shows profit margins keep increasing. And the energy companies are ripping off UK consumers with further price hikes - adding to inflationary pressures. 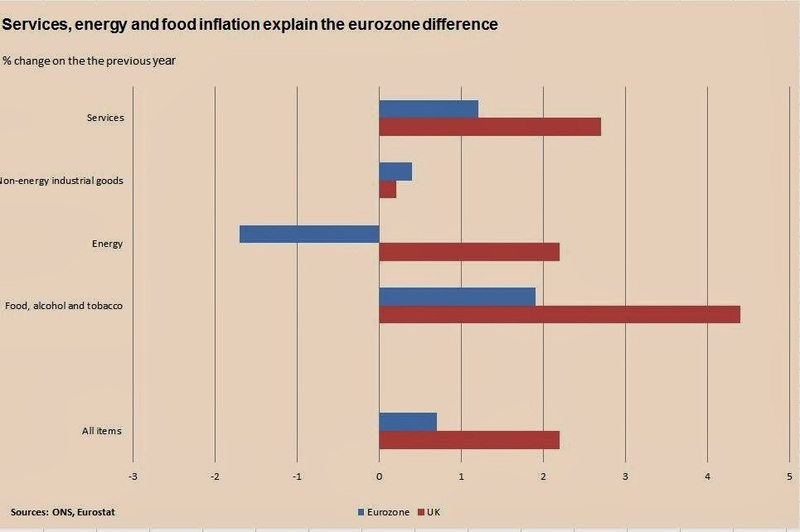 The claim that this is a reflection of wholesale prices is refuted by this graph comparing causes of inflation between the UK and the Eurozone. 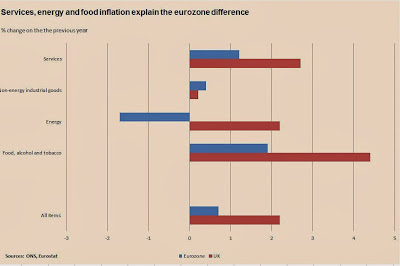 The gross disparity between the Eurozone (where energy prices have fallen sharply) and the UK where prices have risen (and are bout to rise more sharply) clearly tells the story of the UK energy cartel ripping off consumers. No wonder 68% want energy renationalised. Even John Major (the Prime Minister who privatised the railways, which 66% want renationalised) now supports a windfall tax on the energy companies. And it's little better with the banks - as our European neighbours again show us up. The chart below shows the difference between the interest banks give to savers and the rates they charge borrowers. 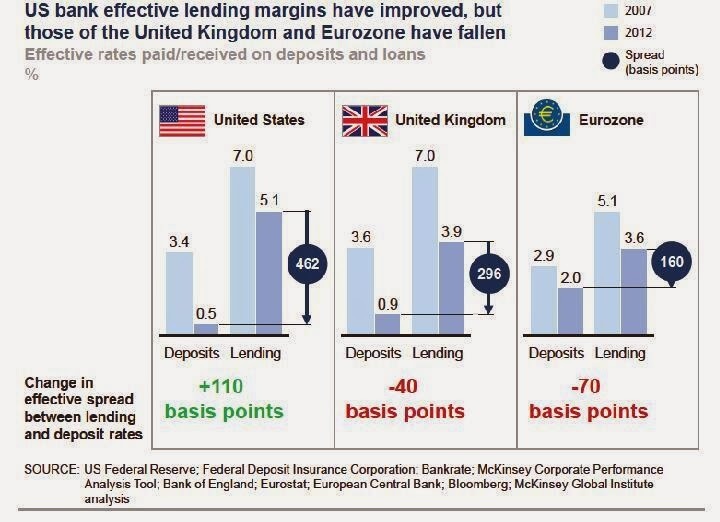 While UK banks have lower margins than US banks, they are far wider than Eurozone banks. Tax Justice - Are you serious?